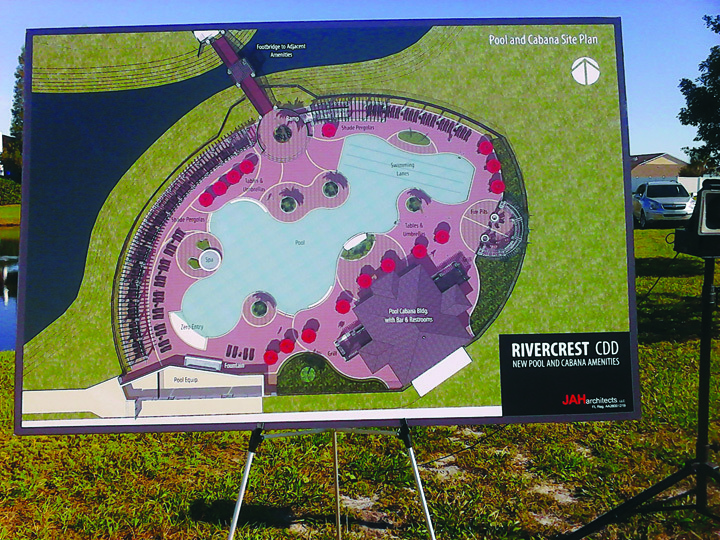 Rivercrest CDD Board members, residents and dignitaries gathered recently to break ground on the community’s new pool and open-air cabana area featuring a picnic area for 20-40 people, TVs, fire pits and a 7,000 sq. ft. pool. Rivercrest is composed of 235 town homes, 218 duplexes and 927 single family homes. In addition, the development contains commercial sites, which total approximately 16 acres. There also is an eight acre amenity center which includes a resort style swimming pool, an aqua tot lot, playground, basketball courts and soccer field. In addition, the development includes neighborhood parks, which are connected by pedestrian walkways. When Leventry joined the CDD seven years ago, the board had a $100,000 deficit and home values in Rivercrest were plummeting, he explained. Today, the board is operating at a $100,000 surplus and more $800,000 has been put away for this project. This surplus means that CDD fees will not be raised. “We are pretty proud of where we have come financially and where we are going,” Leventry said. Leventry reported that in the seven years that he has been on the CDD board, fees have been raised two times, averaging $30 per year. The community center is phase one of the master plan that the CDD and JAH Architects put together two years ago. Phase two will include a new dog park and storage area by the garage, multi-purpose fields featuring bleachers, water and electricity. Phase three calls for a gymnasium equipped with tread mills, free weights, showers and more, and the final phase is to build a new 6,000-sq.-ft. clubhouse next to the existing clubhouse ideal for weddings and special events. “All of this will increase the value of the community, bring everyone together and bring up the value of the homes,” he stated. Rivercrest is located at U.S. Hwy. 301 just South of Symmes Rd. Visit www.rivercrestcdd.org.